An example of an upper airway examination is provided below. 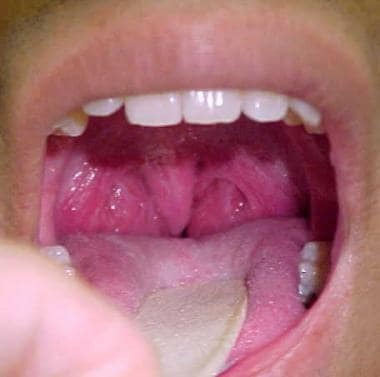 Oropharyngeal examination in a 35-year-old man reveals Mallampati grade I presentation of the palate's velum. For patient education information, see eMedicineHealth's Ear, Nose, and Throat Center and Sleep Disorders Center, as well as Snoring, Sleep Disorders in Women, and Sleep Disorders and Aging. The upper airway begins at the entrance of the nose and continues to the hypopharynx. The structures forming the upper airway are the nose and the pharynx with its 3 divisions (ie, nasopharynx, oropharynx, hypopharynx). Each of these areas has different pathologies that can produce stenosis of the airway and/or cause obstruction; sometimes, obstruction is found in several areas in varying degrees. The lower airway begins in the trachea and continues to the bronchial tree. Structures of the nose that are areas of special concern are the internal nasal valve, the septum, and the choana. In the oropharynx, the soft palate, tonsils, palatoglossal and palatopharyngeal arches, and the tongue are structures of concern. In addition, the cross-sectional diameter of the pharynx can be smaller in many patients, playing an important role in the pathogenesis of OSA. In the hypopharynx, the base of the tongue is the most influential structure. A systematic approach to the physical examination is recommended to avoid confusion. Briefly discussed are the general appearance and facial and cervical features. Examination of the nasal and nasopharyngeal and oral and oropharyngeal regions are discussed in separate sections. Many adult patients with obstructive sleep apnea syndrome (OSAS) are overweight or obese, and Pickwick syndrome in patients with obesity is associated with hypersomnolence and sleep apnea. Many obese patients also have a narrow pharynx, and patients with a wide and short neck are prone to develop OSA. Waist and neck circumferences have a strong correlation with the severity of sleep apnea. However, children with OSA are not necessarily obese; rather, they are lacking in development and are generally underweight. Elevated levels of interleukin-6 (IL-6), tumor necrosis factor-a (TNF-a), and insulin have been found in patients with excessive daytime sleepiness (EDS). Vgontzas et al proposed that these cytokines are mediators of daytime sleepiness. Visceral fat was found to be a primary parameter linked to OSAS. Obstruction of the nasal passage can begin at the entrance. Rhinoscopy can reveal nasal septum deviations and problems at the valvular area. The area of highest resistance in the nose is the nasal valve; therefore, a small deviation in that area can produce a higher degree of obstruction than a larger deviation in any other part of the nose. External nasal valve collapse can be produced by weakening of the alar rim or by an extremely wide columella. The internal nasal valve is also a common source of obstruction. A small deflection of the nasal septum in this area produces more obstruction than in any other part of the nose. Deviations of the nasal septum can produce obstruction of the nasal passage. When the deviation is big enough, the contralateral inferior turbinate develops hypertrophy to compensate for the excessive widening of the nasal fossa. This hypertrophic turbinate sometimes produces obstruction by itself. The nasopharynx can be better examined with a rigid or flexible endoscope, because the nasopharynx is located at the bottom of the nasal cavity. The most common problem in this area is adenoid hypertrophy, which can be large enough to produce nasal obstruction. Adenoid hypertrophy is normal in children aged 6 months to 5-6 years; absence of hypertrophy is abnormal at this age. Adenoid hypertrophy in adults is uncommon  ; however, several studies report this pathology in patients as old as 52 years. This author has found adenoid hypertrophy confirmed by histopathologic examination in patients as old as 63 years. Nasal obstruction due to new onset of adenoid and/or tonsil hypertrophy in adults can be an initial sign of human immunodeficiency virus (HIV) infection. [14, 15] Tumors are an uncommon finding. Dental anomalies, such as open-bite deformity or micrognathia class II occlusion, are easy to detect. A high arched palate is common in patients with chronic nasal obstruction. Gum size is important, because hypertrophic gums are generally associated with chronic oral respiration. The velum of the palate is particularly important for the pathology of airway obstruction. A long or flaccid velum can produce obstruction. The soft palate is frequently elongated, increasing the possibility of snoring. Many patients have pharyngeal and palatal edema after sleep because of the snoring-induced trauma. Upon examination, the patient is asked to open the mouth and extend the tongue to assess the length of the soft palate. The Mallampati classification is used to describe the size of the palate and its relationship to the rest of the pharyngeal structures (see the images below). This classification helps to predict the difficulty of orotracheal intubation. The uvula in patients with obstructive sleep apnea (OSA) is generally larger than that of the normal population, due to edema and thickening of the covering epithelium. In addition, the uvula of snorers and OSA patients contains less muscle than that of nonsnorers and can sometimes produce obstruction because of the edema. Oropharyngeal examination in 45-year-old man reveals Mallampati II presentation of the palate's velum. Mallampati III presentation in a 24-year-old woman. Notice how the palatal arches cannot be visualized. Oropharyngeal examination in a 29-year-old man reveals airway obstruction due to tonsillar hypertrophy. Perhaps the most important factor in OSA is the collapsibility of the pharynx. Most persons with OSA have a decreased tone of the pharyngeal muscles. This allows the pharynx to collapse even with small levels of intrapharyngeal negative pressure (see Flexible Nasopharyngoscopy). Micrognathia can be a life-threatening pathology in some patients, such as those who have Pierre-Robin syndrome. In certain circumstances, temporary glossopexy may need to be performed to avoid asphyxia until a secure airway is obtained. Examination of the hypopharynx requires the use of a laryngeal mirror, flexible endoscope, or a magnifying laryngoscope. A gag reflex that is very intense is a common problem in some patients and can make performing the examination of the hypopharynx difficult or impossible. Flexible nasopharyngoscopy is the method of choice in these patients (see Flexible Nasopharyngoscopy). The size of the hypopharynx can be decreased because of alterations at the base of the tongue, and the diameter of the hypopharynx is decreased in obese patients. The Friedman classification is intended to identify prognostic indicators that will lead to stratification of patients likely to have successful uvulopalatopharyngoplasty (UPPP) versus those who are destined to failure of this treatment. This classification considers the individual’s palate position, tonsil size and body mass index (BMI). The tonsils are hidden within the pillars. The tonsils are extended to the pillars. The tonsils are extended beyond the pillars but not to the midline. The tonsils are extended to the midline. The BMI is determined to be less than or greater than 40 kg/m2. The table below uses the palate position, tonsil size, and BMI to determine the patient’s clinical OSA stage. In a study with 134 patients, Friedman et al found that patients in stage I have the better chance to improve the apnea-hypopnea index (AHI) and the minimum arterial oxygen saturation (SpO2) after UPPP. Patients in stage II have a low probability to improve AHI but have an improvement in minimum SpO2. Patients in Stage III didn’t have any improvement in AHI or minimum SpO2 after surgery. Most of the characteristics discussed in Physical Evaluation are suggestive of sleep apnea; however, none is considered pathognomonic of the disease. Radiologic examination and polysomnography are necessary to complement the study and are of particular importance in choosing the best treatment for the patient. A study by Woodson and Nagnuma found no correlation between Mallampati presentation and Müller maneuver and the apnea-hypopnea index (AHI),  but the same study established a correlation between AHI and body mass index (BMI), posterior wall redundancy, and endoscopic retropalatal size. However, the sensitivity (50-60%) and specificity (63-70%) of the clinical impression are low. Superior airway resistance measurement and manometry were developed to evaluate the difference in pressure in the areas with high possibility of collapse (ie, hypopharynx, oropharynx, the region of the velum of the palate). The relative pressures in these areas are compared with the pleural pressure measured through the esophagus. Although this test may be performed during polysomnography, it is not commonly used because of its complexity. Different imaging methods for the evaluation of patients with obstructive sleep apnea (OSA) have been tried. Radiologic evaluation should aid in making a correct diagnosis and in planning the appropriate treatment. This, however, is not always the case. The anatomy of the pharyngeal walls should be correctly evaluated using the various diagnostic tools available. The airway was previously evaluated using measurements of electromyographic activity during sleep and intrapharyngeal pressure. However, these methods did not accurately represent the behavior of the pharyngeal structures surrounding the airway. Currently, different methods are used to provide a better understanding of the airway, such as acoustic reflection, fluoroscopy, cephalometry, computed tomography scanning, and magnetic resonance imaging. The advantage of these methods is that they are not invasive, although some of them involve exposure to x-ray radiation. Nasopharyngoscopy provides an image of the upper airway, and dynamic tests can be performed. The only drawback is that nasopharyngoscopy is invasive, although the discomfort produced by the instrument has been reduced considerably with the new slimmer models. Flexible nasopharyngoscopy is popular for obstructive sleep apnea (OSA) examination. This modality allows examination of the nose, all portions of the pharynx, and the larynx—in one procedure. In addition, when performing the nasopharyngoscopy, dynamic tests are possible. The base of the tongue and the glossoepiglottic recesses are examined by asking the patient to extend his/her tongue. Evaluating the diameter of the pharynx and the characteristics of the epiglottis is also possible. It does not involve radiation exposure. Performance of dynamic tests is possible. It is useful to evaluate the obstruction at the retropalatal and retroglossal levels. It is easily reproducible preoperatively and postoperatively. The test may be performed with the patient in sitting or supine position. The test may be performed with the patient awake or sleeping. The test is widely available and relatively inexpensive. It is an invasive technique, and it can produce some discomfort when introducing the nasopharyngoscope into the nose. It gives an approximate idea of the pharynx, because it is not possible to make any measurements. The evaluation depends on the experience of the examiner. Fluoroscopy has the advantage of producing dynamic images with the patient seated or reclining, awake or sleeping. This technique is useful to evaluate the areas of obstruction in the supine position. However, fluoroscopy is not sensitive enough to measure changes in the cross-sectional size of the airway. Other drawbacks of the technique are that the patient has great exposure to x-ray irradiation and that performing sectional cuts of the area is not possible. This situation has made fluoroscopy impractical and has limited its use. This plain radiographic study is the most commonly used technique in patients with obstructive sleep apnea (OSA) (see the following image). Cephalometry is used to examine both the soft tissue and the osseous structures related to the airway. This modality is widely available, easy to perform, and has a low cost. One of the main advantages is that it is standardized. The exposure should be taken at the end of the expiration. 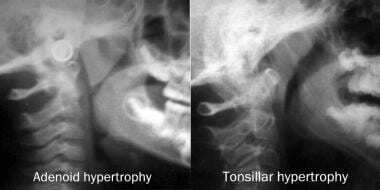 Plain radiographs of patients with adenoid hypertrophy (left) and another with tonsillar hypertrophy (right). Notice the reduction in the airway in the pharynx at the level of the base of the tongue cause by the tonsils. The adenoids cause obstruction in the rhinopharynx. Several authors have found that the narrowing of the airway in patients with OSA takes place mainly in the laterolateral direction. This limits the utility of the study, but it still has a place in the evaluation of the patient and especially in those individuals in whom involvement of the mandible or maxilla is suspected to produce obstruction. Special notice should be given to the adenoids, which can be evaluated more accurately in cephalometry because of the better alignment of the head. This avoids the distortion produced by rotation of the head, which can suggest a false hypertrophy of adenoids. Several classifications of adenoid hypertrophy exist. However, because of the variation of the pharyngeal size at different ages and the variation between different children, establishing a normal size of the retropalatal space is difficult. Viewing the tonsils in patients with tonsillar hypertrophy is also possible. S – This point is taken from the center of the sella turcica. N – The nasion is the most anterior point of the frontonasal suture. A – The subspinal point is the most depressed part of the superior incisive fossa. B – The supramental point is the most depressed part of the inferior incisive fossa. Gn – The gnathion is the most inferior point of the mandibular symphysis. 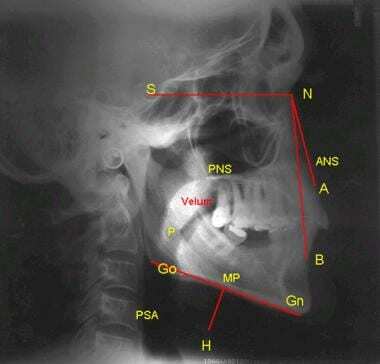 Go – The gonion is the most posterior and inferior point of the angle of the mandible. H – The hyoid is the most anterior and superior point of the hyoid body. MP – The mandibular plane is a plane joining the gonion with the gnathion. PSP – This is the posterior nasal spine. P – This is the most inferior and posterior point of the soft palate. Cephalometric analysis for obstructive sleep apnea. The SNA angle measures the projection, anterior or posterior, of the maxilla. The reference range value is 82 ± 2°. The SNB angle measures the position of the mandible. The reference range value is 80 ± 2°. Less than this is considered retrognathia. The ANB angle measures the position of the maxilla with the mandible. The reference range value is 2°. This measures prognathism. MP-H is the distance between the mandibular plane (MP) and the hyoid bone (H). The reference range is 11-19 mm. The longer the distance, the higher the possibility of the patient having OSA. PSN-P is the length of the velum of the palate. The reference range value is 37 ± 3 mm. G is the width of the velum of the palate. The reference range is 6-10 mm. PAS is the posterior airway space or retroglossal space; the reference range is 10-16 mm. The retropalatal space is the narrowest measurement between the posterior surface of the velum of the palate and the posterior pharyngeal wall. Computed tomography (CT) scanning produces excellent resolution of images to evaluate both the soft tissue and the osseous structures of the pharynx-larynx complex. In CT studies, viewing the difference in shape of the pharynx between nonsnorers, snorers, and patients with obstructive sleep apnea (OSA) is possible, and this imaging modality has been used by many authors studying the pathogenesis of OSA. CT scanning has the advantage of producing axial and coronal cuts, as well as sagittal reconstructions. In addition, not only is taking measurements is possible, but volumetric reconstruction and 3-dimensional (3-D) imaging is also possible with the newer equipment (helical CT scanning). The advantages of CT scanning are its wide availability and the quickness with which newer scanners can perform studies. Volumetric and 3-D reconstructions of the airway and other peripharyngeal structures are possible. The study is performed in the supine position. Disadvantages of the study are that radiation is involved, limiting the number of studies that can be performed. (However, a study by Fleck et al determined that dynamic 3-D CT scanning of the upper airway in OSA patients can be performed with an effective radiation dose [under 0.38 mSv] comparable to or below that administered in clinical facial CT scanning.  ) CT scanning is also relatively expensive. The actual image is in the axial plane, so performing a reconstruction is necessary to obtain a sagittal image. High-speed CT scanning (with electron beam) has been used for correlating the image with the different phases of snoring. Magnetic resonance imaging (MRI) is probably the best imaging study for patients with obstructive sleep apnea because of its excellent resolution in the supine position. This modality provides a detailed view of the fat and soft tissue of the pharyngeal walls and its relation with the airway. Obtaining sagittal, coronal, and axial images, as well as 3-dimensional reconstructions, is also possible, as are measurements of the different structures and their volume. MRI has the advantage of being radiation free, thus making performance of several studies possible. Although the noise and the cumbersome design of the machine makes sleeping in it difficult, MRI has been used during sleep to study the effects of continuous positive airway pressure (CPAP) therapy. In addition, performing dynamic studies is possible because of faster equipment. MRI is beginning to have a role in the evaluation of patients before and after surgeries such as uvulopalatopharyngoplasty (UPPP), resection of tongue base, or geniohyoid muscle surgery. MRI is an expensive study, especially with the newer technologies, making its price the real limit to the number of studies that can be performed. Sher AE. The upper airway in obstructive sleep apnea syndrome: Pathology and surgical management. In: Thorphy MJ, ed. Handbook of Sleep Disorders. 1990. New York, NY: Marcel Dekker:311-35. Potsic WP, Wetmore RF. Sleep disorders and airway obstruction in children. Otolaryngol Clin North Am. 1990 Aug. 23(4):651-63. [Medline]. Olszewska E, Woodson BT. Palatal anatomy for sleep apnea surgery. Laryngoscope Investig Otolaryngol. 2019 Feb. 4 (1):181-7. [Medline]. [Full Text]. Magliulo G, Iannella G, Ciofalo A, et al. Nasal pathologies in patients with obstructive sleep apnoea. Acta Otorhinolaryngol Ital. 2019 Mar 25. [Medline]. Feldman BS, Quan SF. Tonsillar lymphoma as a cause of obstructive sleep apnea. Sleep Med. 2002 Sep. 3(5):441-2. [Medline]. Li HY, Fang TJ, Lin JL, Lee ZL, Lee LA. Laryngomalacia causing sleep apnea in an osteogenesis imperfecta patient. Am J Otolaryngol. 2002 Nov-Dec. 23(6):378-81. [Medline]. Okami K, Onuki J, Sakai A, Tanaka R, Hagino H, Takahashi M. Sleep apnea due to Kimura's disease of the larynx. Report of a case. ORL J Otorhinolaryngol Relat Spec. 2003 Jul-Aug. 65(4):242-4. [Medline]. Dematteis M, Pépin JL, Jeanmart M, Deschaux C, Labarre-Vila A, Lévy P. Charcot-Marie-Tooth disease and sleep apnoea syndrome: a family study. Lancet. 2001 Jan 27. 357(9252):267-72. [Medline]. Davies RJ, Stradling JR. The relationship between neck circumference, radiographic pharyngeal anatomy, and the obstructive sleep apnoea syndrome. Eur Respir J. 1990 May. 3(5):509-14. [Medline]. Lowe AA. The tongue and airway. Otolaryngol Clin North Am. 1990 Aug. 23(4):677-98. [Medline]. Nakata S, Noda A, Misawa H, Yanagi E, Yagi H, Nakashima T. Obstructive sleep apnoea associated with congenital choanal atresia. J Laryngol Otol. 2005 Mar. 119(3):209-11. [Medline]. Kamel RH, Ishak EA. Enlarged adenoid and adenoidectomy in adults: endoscopic approach and histopathological study. J Laryngol Otol. 1990 Dec. 104(12):965-7. [Medline]. Kraus DH, Rehm SJ, Orlowski JP, Tubbs RR, Levine HL. Upper airway obstruction due to tonsillar lymphadenopathy in human immunodeficiency virus infection. Arch Otolaryngol Head Neck Surg. 1990 Jun. 116(6):738-40. [Medline]. Claessen JQ, Tilanus CC, Albers FW. [Adenoid hypertrophy as initial symptom of an infection with the human immunodeficiency virus]. Ned Tijdschr Geneeskd. 1991 Mar 23. 135(12):525-7. [Medline]. Hamans EP, Van Marck EA, De Backer WA, Creten W, Van de Heyning PH. Morphometric analysis of the uvula in patients with sleep-related breathing disorders. Eur Arch Otorhinolaryngol. 2000. 257(4):232-6. [Medline]. Catalfumo FJ, Golz A, Westerman ST, Gilbert LM, Joachims HZ, Goldenberg D. The epiglottis and obstructive sleep apnoea syndrome. J Laryngol Otol. 1998 Oct. 112(10):940-3. [Medline]. Naganuma H, Okamoto M, Woodson BT, Hirose H. Cephalometric and fiberoptic evaluation as a case-selection technique for obstructive sleep apnea syndrome (OSAS). Acta Otolaryngol Suppl. 2002. 57-63. [Medline]. Do KL, Ferreyra H, Healy JF, Davidson TM. Does tongue size differ between patients with and without sleep-disordered breathing?. Laryngoscope. 2000 Sep. 110(9):1552-5. [Medline]. Moser RJ 3rd, Rajagopal KR. Obstructive sleep apnea in adults with tonsillar hypertrophy. Arch Intern Med. 1987 Jul. 147(7):1265-7. [Medline]. Erdamar B, Suoglu Y, Cuhadaroglu C, Katircioglu S, Guven M. Evaluation of clinical parameters in patients with obstructive sleep apnea and possible correlation with the severity of the disease. Eur Arch Otorhinolaryngol. 2001 Nov. 258(9):492-5. [Medline]. Woodson BT, Naganuma H. Comparison of methods of airway evaluation in obstructive sleep apnea syndrome. Otolaryngol Head Neck Surg. 1999 Apr. 120(4):460-3. [Medline]. Tsai WH, Remmers JE, Brant R, Flemons WW, Davies J, Macarthur C. A decision rule for diagnostic testing in obstructive sleep apnea. Am J Respir Crit Care Med. 2003 May 15. 167(10):1427-32. [Medline]. Rizzi M, Onorato J, Andreoli A, Colombo S, Pecis M, Marchisio P, et al. Nasal resistances are useful in identifying children with severe obstructive sleep apnea before polysomnography. Int J Pediatr Otorhinolaryngol. 2002 Aug 1. 65(1):7-13. [Medline]. Schlesinger AE, Hernandez RJ. Radiographic imaging of airway obstruction in pediatrics. Otolaryngol Clin North Am. 1990 Aug. 23(4):609-37. [Medline]. Soda-Merhy A. Evaluacion Clinica. Sindrome de Apnea del Sueno. Mexico: SMORL: 2000:20-9. Stuck BA, Maurer JT. Airway evaluation in obstructive sleep apnea. Sleep Med Rev. 2008 Dec. 12(6):411-36. [Medline]. Lugo-Saldaña R. Current techniques in sleep disordered breathing. Lalwani AK, Pfister MHF, eds. Recent advances in otolaryngology, head and neck surgery. Jaypee; 2012. 140-164. Huo H, Li W, Tian X, et al. Endoscopic upper airway evaluation in obstructive sleep apnea: Mueller's maneuver versus simulation of snoring. Sleep Breath. 2015 May. 19(2):661-7. [Medline]. Fleck RJ, Ishman SL, Shott SR, et al. Dynamic Volume Computed Tomography Imaging of the Upper Airway in Obstructive Sleep Apnea. J Clin Sleep Med. 2017 Feb 15. 13 (2):189-96. [Medline]. Kwan BCH, Juge L, Gandevia SC, Bilston LE. Sagittal Measurement of Tongue Movement During Respiration: Comparison Between Ultrasonography and Magnetic Resonance Imaging. Ultrasound Med Biol. 2019 Apr. 45 (4):921-34. [Medline]. [Full Text].